Those are very easy Cupcakes , you can enjoy them simply without Frosting with a cup of Tea or Coffee ,or you can take them to Picnics or parties , here's the easy yet delicious recipe ! This Cake was a very special Cake I made, as I made it for my Husband's Birthday :) He loves Chocolate, so I decided to make something with triple Chocolate layers ! I used a Cake that I made before & that we all love , then added a layer of Chocolate Ganache, then a layer of chocolate Mousse . It was so chocolaty & so delicious ! For Chocolate lovers, you will all love this Cake for sure ! You Can decorate with Fresh Fruits or Berries or Whipped Cream, just use your own creation for decorating. This Cake also looks really elegant & can be used in family fests or celebrations . Chocolate Buttercream Frosting. Schokoladen Frosting für Cupcakes. This is a very nice & easy & delicious Frosting for Cupcakes, My aim doing this Frosting was to decrease the amount of Sugar as much as possible because I don't like the very sugary Frosting ! Raspberry Red Velvet Cupcakes . Himbeeren red velvet Cupcakes. It's Valentine's & everyone around is spreading red recipes :) I had some Raspberries at home & thought of incorporating them in those lovely Cupcakes & in the Frosting as well !! I got the best result ever for Red velvet Cupcakes ! 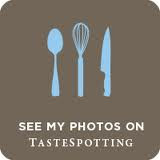 I simply loved it & loved the Mascarpone- Raspberry Frosting. Those are really easy & fast Cakes, that I do for the kids often , They are delicious & nutritive for Kids too. The ingredients here are for 6 Cupcakes or mini Cakes & you can double the amount if you want to do more. This is a type of Pound Cake that is popular in Germany called Sandkuchen ( Sand Cake ) , It's very easy & so delicious & perfect when you are having guests & also perfect as a Coffee Cake. My kids love Cake pops , but It's usually hard for me doing a cake ,then crumbling it, then adding it to another mixture,then waiting to cool....etc. It was so much work for an -always busy- Mom like me :) So I thought of doing mini cupcakes & sticking them to a Cake pop stick & it's done! The result was perfect & unfortunately was finished in half a day , my kids gave to friends & neighbours ! Second day, I loved the Idea, so I made my brownies recipes & cup it in small cubes & inserted wooden skewers in them & were just perfct & kids loved them too . After so many Chocolate Cake trials ,this happens to be my favourite! moist, chocolaty & melts in your mouth. 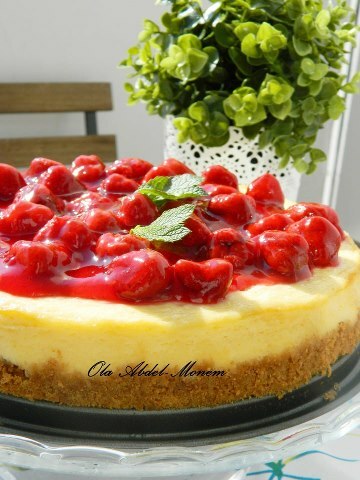 This is my favourite cheesecake, made with homemade Strawberry Sauce, yuuummmmy! Fruit Cakes are my favourite, today I decided to do anything with Raspberries before it totally disappears from stores :) my choice was this simple & easy, yet elegant Cake, What I had at home was a jar of Peaches & I decided to include it in the Cake content & it was simply Perfect! Preheat your oven to 180°C before starting preparation. Prepare your 24cm cake form by covering with butter & flour. Start beating butter & sugar till creamy. add eggs & vanilla & keep beating till creamy & fluffy. add milk ,then the dry ingredients & beat. spread the Batter in the spring form, cover with Peaches & Raspberries & sprinkle the sliced Almonds. Enter the oven for nearly 40 minutes or untill a tooth pick inserted into the batter comes out clean. let cool for a while & spread some fresh Raspberries & sprinkle some powdered sugar on top. *prepare 26 cm springform by brushing with Butter & adding flour. enter oven for 20 minutes then remove & cool & divide into 2 layers. *Cut strawberries & mix with sugar & other berries & leave for 5 minutes. *whipp the whippingcream, & add the sugar to it ,then add the creamcheese-sourcream mixture. put the first layer of sponge cake & pour 3-4 Table spoons juice then cover with 1/2 the cream & 1/2 the berries , then add the other half of sponge cake & pour the rest of the juice then cream then berries. Eier trennen. Eiweiß mit 1 Prise Salz & Zucker Steif schlagen. Eigelbe mit Vanillzucker sowie Zitronenschale unterrrühren. Mehl mit Backpulver mischen, darübersieben & unterheben. Masse in eine mit Backpapier ausgelegte Springform 26 cm füllen, glatt streichen & im Ofen ca 20 min. backen. Herausnehmen, auskühlen lassen & waagerecht halbieren. Sahne mit Sahne-Steif & Zucker steif schlagen. Schmand & Frischkäse rühren. Dann Sahne hinzufügen. Erdbeeren schneiden & mit Zucker, Himbeeren & Blaubeeren mischen & für 5 Minuten ruhen lassen. Einen Biskuit auf eine Tortenplatte setzen, mit 3 EL Ananas Saft begießen, & mit der Hälfte der Creme abdecken & glatt streichen & die Hälfte der Bereen geben. Zweiten Biskuit auflegen & mit 3 EL Saft gießen & mit Creme & Beeren abdecken. Mit Minze Blätter garnieren. melt chocolate & butter & let them cool for a while. add walnuts at the end. enter preheated oven for 25-30 minutes. & decorate with Raspberries or strawberries. u can also sprinkle some powdered sugar.